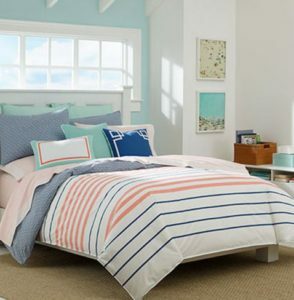 I’ve rounded up my favorite nautical bedding sets for you. 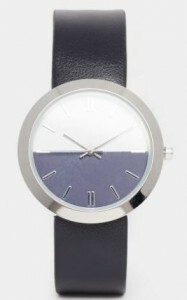 Choose from shades of blue, red, white or tan. 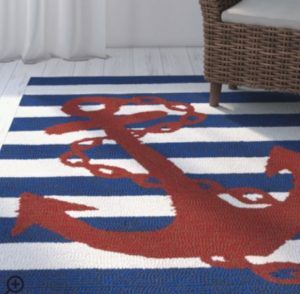 These sets will set the mood for the perfect nautical bedroom. 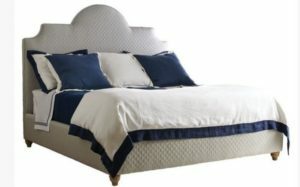 Bedding Style – Save 25% Off Bedding, Bath and more! Plus Free Shipping on All Orders. Use coupon code PRES25. Ends 2/20. 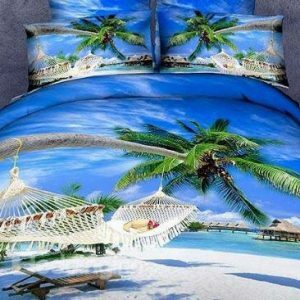 They have lots of coastal bedding sets. 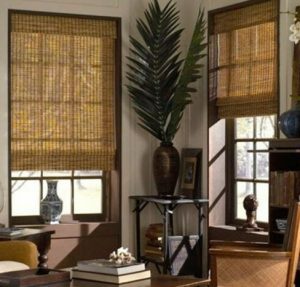 Blinds.com –Save up to 40% Sitewide via code PRESIDENTS-DAY at checkout. Ends 2/21. Home Square – President’s Day Sale has items to up 70% off. As you know, I am a travel agent. 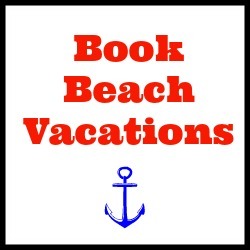 There are several beach travel deals going on now. 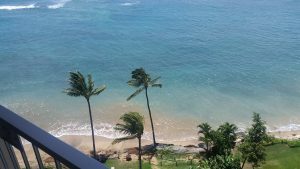 Check out these Hawaii airfare sales. This weekend, Royal Caribbean Cruises is offering 60% off the 2nd guest in a cabin, 30% off 3rd and 4th guests and up to $100 in onboard credits. Valid for cruises after 3/19/17. Call me 877-34-TRIPS or email me at Krista@SnobTrips.com to get a free quote. 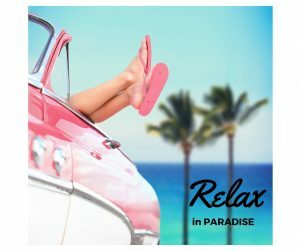 Shindigz – is offering 20% off your order via code PRESIDENT. 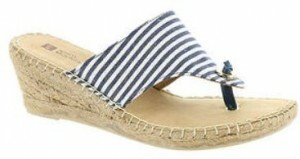 Or, get free shipping on $75+ via code SHIP75. Ends 2/20. 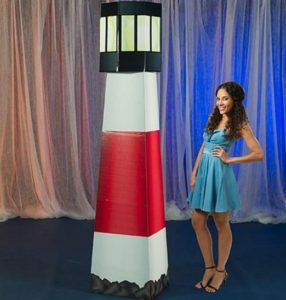 Pick up some nautical party supplies. Wayfair President’s Day Sale is one to really check out. 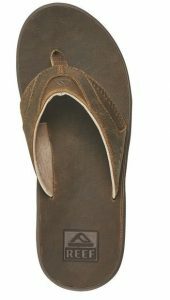 Save up to 70% on select items. Any world traveler will appreciate this fun Tommy Bahama Caribbean map quilt. It features many gorgeous islands. View more nautical quilts here. 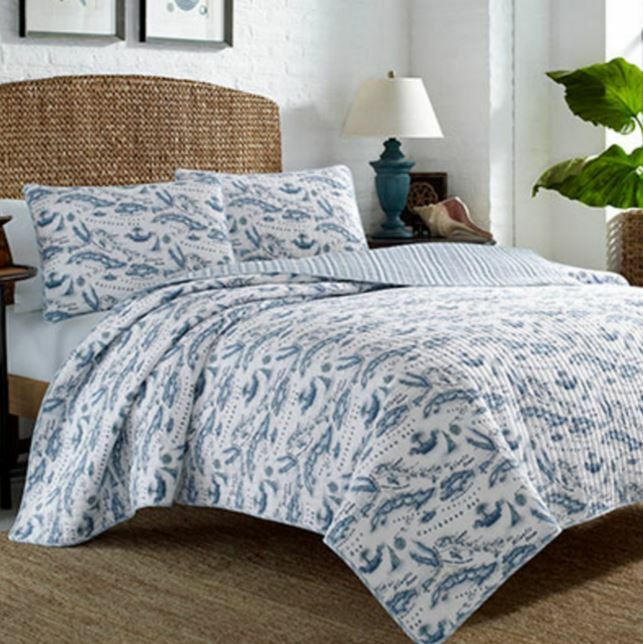 Create a relaxing oasis with this tone on tone seashells quilt. 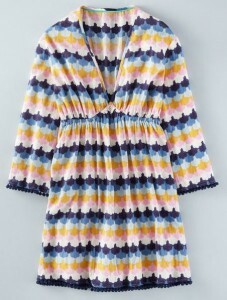 With colors reminiscent of sand, you can dream about romantic beach walks. 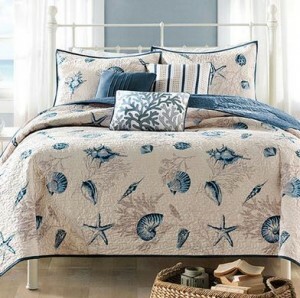 View more nautical bedding here.